The story of the Deeside Railway dates back to 1853. It was opened as a single-track (originally from Ferryhill, in Aberdeen, through Cults and Culter to Banchory) in September of that year. 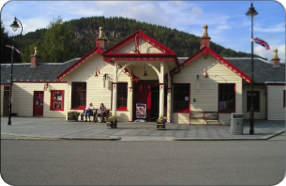 The Aboyne extension opened in December 1859, and was the terminus until the line was continued to Ballater by the Aboyne & Braemar Railway in 1866. The railway took a route through Torphins and Lumphanan, rather than the straight line through Kincardine O’Neil - allegedly because the Estate there refused permission to build on their land. It was then operated by the Great North of Scotland Railway (GNSR) before being absorbed by them. The original proposal and aim, to reach Braemar, was never fulfilled. A tramway was actually built from Ballater to Bridge of Gairn for the transport of felled timber from Invercauld estate, and it was removed unused. Queen Victoria had objected to the extension - fearing invasion of her family’s privacy, and disturbance to her estate at Balmoral. However, by 1914 this was on the GNSR agenda again, but the outbreak of war finally killed it off. 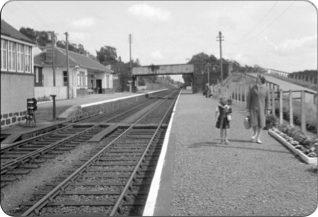 A quarter mile long branch line diverged at the west end of Culter station to serve the Culter Paper Mill, which had its own Peckett of Bristol built ‘Puggy’ saddle tank loco to haul wagons in and out of the sidings there. Almost no trace of this line still exists. 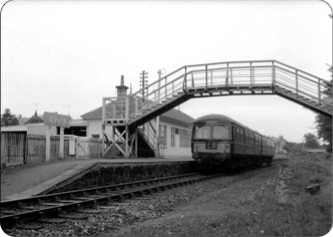 In the 1890's, the lines between Ferryhill and Culter were doubled to increase track capacity for the introduction of 'Subbies' (or commuter stopping trains, running from Culter to Dyce). 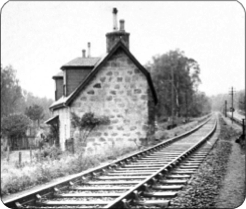 Doubling of the line was continued as far as Park station, with the aim of reaching Banchory, but again the outbreak of World War I curtailed this plan. The GNSR became part of the London & North Eastern railway (LNER) during the 1923 Grouping, then in 1948 British Railways assumed responsibility for the Deeside Line. Over the years Ballater saw a great variety of steam locomotives, as well as diesel power from the late 1950s. For instance the GNSR Class ‘F’ 4-4-0 (later Class D40) of which 'Gordon Highlander', the sole survivor, is now at the Scottish Railway Museum at Bo’ness. The first diesel on Deeside, BR Class 20, No. D8031 is now preserved at the Keighley & Worth Valley Railway. From 1958 an electric battery multiple unit, affectionately christened 'The Sputnik' was used experimentally until 1962 : it can now be enjoyed by passengers on the Royal Deeside Railway. All operations on the line were completely diesel powered in 1961, with no steam workings until the very last train to Culter on December 30th 1966. Apart from the Battery Electric Multiple Unit, diesel railcars of Metro-Cammel (Class 101) & Cravens (Class105) handled passenger trains. Freight trains were hauled by English Electric Type 1 (Class 20) and North British Type 2 (Class 21) locos. The Deeside Railway was a Royal line from its earliest days. For the next 100 years it was the track along which succeeding generations of royalty travelled en route to Balmoral Castle. When the Royals were in residence the GNSR ran special daily "Queen's Messenger" trains. The express messenger trains were unique to the GNSR at this time, and were intended for dispatches. Royal passengers included George VI and the Queen Mother; Queen Elizabeth II and her children Charles and Anne.The excellent exhibitions currently at the refurbished Ballater Station tell a lot more of this Royal history. Queen Victoria first travelled on the Deeside line in 1853, doing so until 1900 - a few months before she died in 1901. The last Royal train left Ballater, with the present Queen on board, in October 1965. 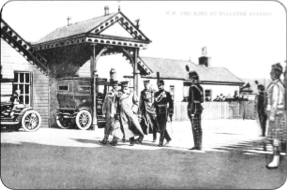 Ballater Station was intimately connected with royal patronage. At first it was a simple booking office on a single platform, but in 1886 the Royal Waiting Room was built to a design approved by Queen Victoria. Many recent visitors to the station and tourist office will now have seen her waiting room and the fabulous royal toilet ! Among many exotic guests, in 1889 the Shah of Persia travelled to Ballater, a glamorous spectacle in astrakhan cap with a large Persian crest encrusted with diamonds. In 1896 Czar Nicholas II visited the Queen at Balmoral. Despite the unpopularity of Russia politically at that time, they put on a dazzling show - literally, since electric lighting was installed for the occasion for both the station and the Square. - The old Ferry Inn at Cambus o’May (now called Cutaway Cottage) had one corner “sliced” away to make way for the railway. - There was originally a curlers’ platform at the Loch of Aboyne. - The Canadians in particular were involved in felling forests around Ballater as part of the war effort. The Deeside line, from Aberdeen to Ballater, was in the forefront of rural branch railway lines: scenically because of its beautiful views, and socially because of the exceptional array of passengers. From all over the world, they regularly included British and foreign royalty and heads of governments as well as soldiers, tourists, local commuters and shoppers, hillwalkers and cyclists.